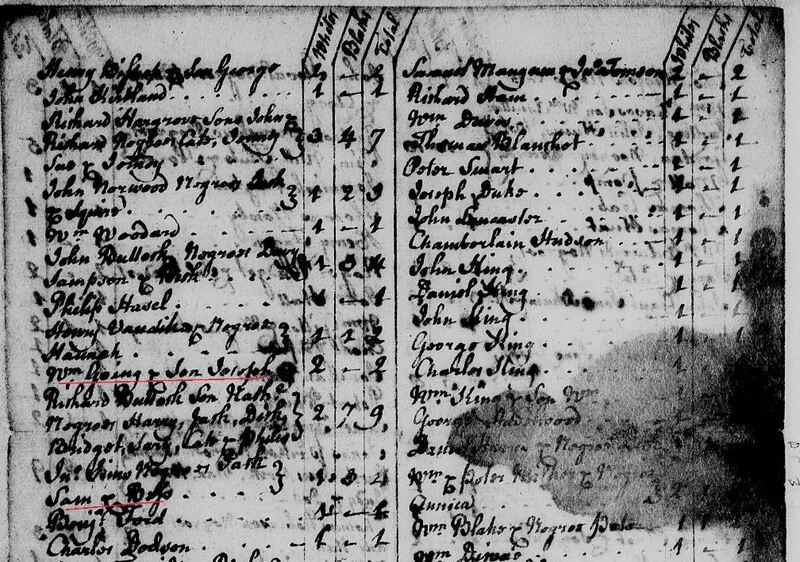 11) Thomas Gowen b. abt 1732 in Lunenburg Co, Va – son of John and Mary Gowen. 1671 May 13 Thomas Going is transp to Talbot Co, MD by Francis Stanton of London, who sold rights to the 500 acres of land to Bryan Omaly of Talbot Co, MD. 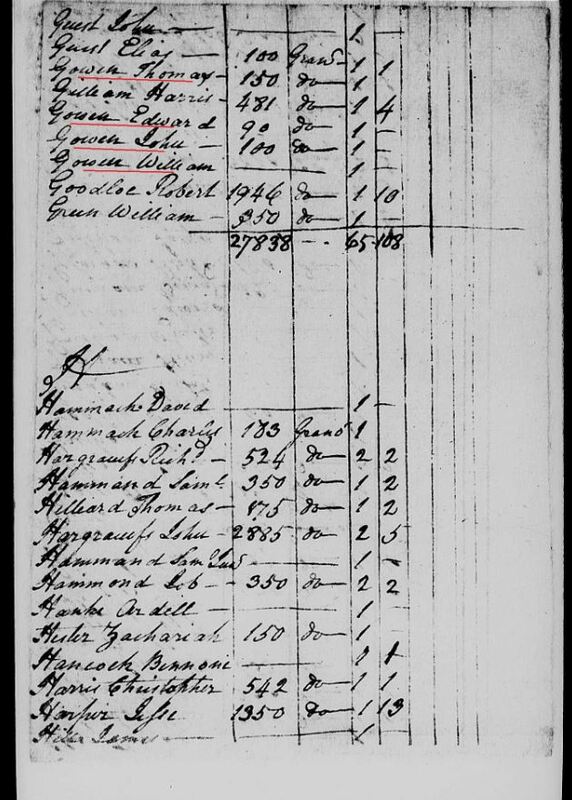 Source: WT:133 Film No: Transported by 1671 ; Transcript: 16:135; MSA SC 4341-http://earlysettlers.msa.maryland.gov/ SERNO: S11. LAND OFFICE (Patent Record)#16, p. 135 Thomas Going, 1671 [MdHR 17,350, 1-23-1-21]. 06/02/92. Tracking No. : 17596. Circ. No. : 6395. http://msa.maryland.gov/msa/refserv/quickref/html/photodup.html . 1672 Esau Goeing and his wife Ann Goeing are noted in service in Maryland. Source: 17:376 Film No: Husband of Ann, service by 1672; MSA SC 4341- 1672 Goeing, Ann17:376 Film No: Wife of Esau Goeing, service by 1672; Anne, the wife of Esau Goeing proved rights to land for service provided in Talbot County, Maryland. Esau Goeing assigned his wife’s rights for her service to John Pitt in Talbot County, Maryland. Note: This transaction tells us a few things a) Anne Goeing was owed for her service – likely this was an indenture, meaning she started her indenture at least 4 years earlier (1668 or before). Since she was married, and selling her rights to her service, she was now free. b) Esau Goeing married Anne Goeing, and as her husband, he was selling her rights due to her for her service. Since he was contracting and married, he obviously was not under any indenture either – no documents have indicated Esau ever was a servant, nor have any documents indicated when Esau Goeing arrived in the Americas. He may have been born in the Americas. Relationship to Thomas Going – it appears this may be Thomas Going. 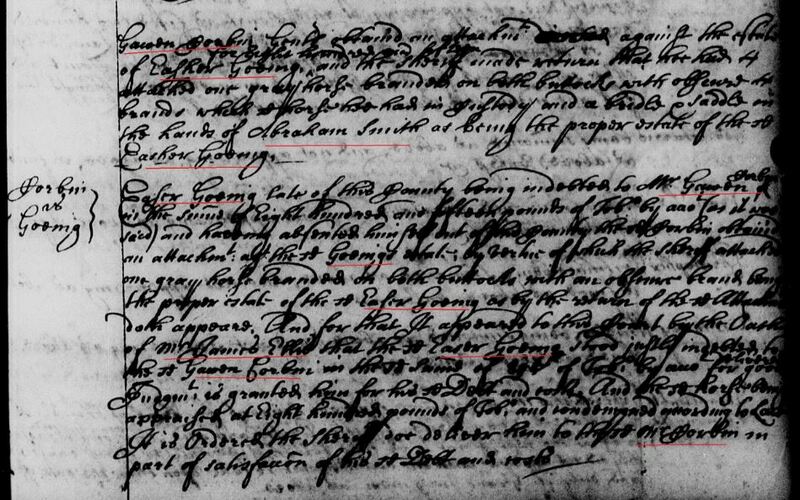 Both Thomas and Esau appear in records in Talbot County, Maryland about 1671/72. Both then appear in records in Westmoreland County, Virginia in 1693. This “suggests” they may be related in some fashion, but it is unknown how. 1693 May 31 Gawen Corbin Gent attachd an attachmt against the estate of Eashaw Goeing for eight hundred and fifty poundsand the sheriff under return that he had it attached one gray horse branded on both buttocks with obscure H brands which a horse has had in custody and a bridle and saddle in the hands of Abraham Smith as being the proper estate of the sd Eashaw Goeing. Easaw Goeing late of this county being indebted to Mr. Gawen Corbin in the summ of eight hundred and fifteen pounds of tobo by cask as it was said and having absented himself out of the county the sd Corbin obtained an attachment agst the sd Goeings estate by Corbin of which the Sheriff attached one gray horse branded on both buttocks with an obscure brand being the proper estate of the sd Easaw Goeing as by the estate of the sd attachmt doth appeare. And for that it appeared to this court by the oath of Mr James Ellis that the sd Easaw Goeing stood justly indebted to the sd Gawen Corbin in that sum of amt of tobo by ammt for good judgment is granted him for his sd debt and (sp?) and the sd horse being appraised at Eight hundred pounds of tobo and undemaned awarding (sp?). It is ordered the sheriff orer over him to the sd Mr Corbin in part of satisfaction of his sd debt and such. 1697 July 28 – On July 28, 1697, Thomas Goen receives a judgment against Joseph Bragg in the amount of 1,300 pounds of tobacco. 1700/01 Feb 28: It was comanded Willo: Allerton Gent sheriff of the County aforesd that hee should arrest Thomas Goen to answer Eliza Beer admnst of Thomas Beer of a plea of debt for five hundred fifty eight pound of tobacco upon which the sheriff returned copi corpus. But the Deft faileing to appeare and no baile being returned, order passed agt the sheriff for the sd debt costs according to law. Willoughby Allerton Gent sheriff of the sd County being comanded to arrest Thomas Goen to answer Eliza Beere admst of Thomas Beere decd in a plea of debt for five hundred fifty eight pounds of tobo. upon which returning copi corpus the deft faileing to appear and no baile being returned order passed agt the sd sheriff for the sd debt and costs according to law wherefore at the request of the sd sheriff order it granted him for an attachment against the estate of the sd Thomas Goen for the sd debt and costs according to law. Westmoreland County Court Orders 1698 to 1705. pg 109. 1701 Aprill 30: Thomas Goen confessed judgmt to Ms Eliza Beer that admnst of Mr. Tho: Beer decd for five hundred fifty eight pounds of tobacco ordered hee pay the same with costs at execution. Westmoreland County Court Orders 1698 to 1705. pg 111. 1702 Oct 1: Judgment is granted Thomas Goen against the estate of John Harris for the sume of two hundred thirty four pounds of tobo: the same appeareing due by account proved by the oath of the said Goen. Ordered hee bee paid the same out of the sd Harrisses estate with costs of suit in his behalf at execution. Westmoreland County Court Orders 1698 to 1705. pg 174.
to Joseph Tayler of this County for the remaining part of his tyme of service not then expired, that his sd tyme of service is some tyme past expired as by the sd assignment if produced would appeare, but the sd Joseph Tayler wrongfully detaines him and refuses to produce the assignment by wch hee pretends to claime a right to his service to the peticoners great detriment and praying to bee discharged from his said master Tayler. Therefore it is ordered that the sheriff of this County do summon the sd Joseph Tayler that hee appeare at the next Court to bee held for this County to answer the sd complt and shew cause if any hee can why hee detaines the said Chapman Dark and because the sd Chapman Dark hath offered to this Court that hee can produce testimony from Maryland that hee is realy free praying liberty to go over to Maryland to procure the same. Thomas Goen haveing assumed to the Court in the summe of two thousand pounds of tobo that the sd Chapman Dark shall appeare before her Majesties justices here at the next Court to bee held for the County to prosecute his said complaint and that in case hee bee not found to bee free hee shall serve his sd master ratably(sp?) after his first tyme expired according to Law for the tme of his absence. It is ordered that hee the sd Chapman Dark have liberty to go for Maryland in order to prosecute his sd pretence. Westmoreland County Court orders 1698 to 1705 pg. 190a. 1703 June 30: Upon a full heareing of all matters debated and argued between Chapman Dark and Joseph Tayler his late master concerning his freedom, it is the oppinion of this Court that the sd Chapman hath served hsi full tyme of service due to his said late master and doe therefore discharge him from any further service pretendedly due to the said Tayler and order that the sd Joseph Tayler doe forthwith pay him his corn and cloaths due to him according to the custom of this Colony together with his costs in the behalf also etc. From which judgment the sd Joseph Tayler appeals to the second day of the next Genl Court. Thomas Goen with the appellee for his appeareance and ordered they enter into bond according to Law for performance of the same. Westmoreland County Court orders 1698 to 1705 pg. 194a-195. (Note: Thomas Atwell’s spouse’s maiden name was Anne Youell (see: http://www.colonial-settlers-md-va.us/getperson.php?personID=I025834&tree=Tree1 ). Anne Youell’s father Thomas Youell, was married to Anne Sturman and an Anne Lee. John Hallowes b. abt. 1586, was married to Ann Youell who came into court in Westmoreland County, Virginia in 1656 and stated she was the widow of Mr. John Hallowes (or Hollis). (Note – Thomas Atwell’s wife had connections with both the Sturman and Youell families, both very closely related to John Hallowes or Hollis b. abt. 1586 and his son John Hallowes or Hollis b. abt. 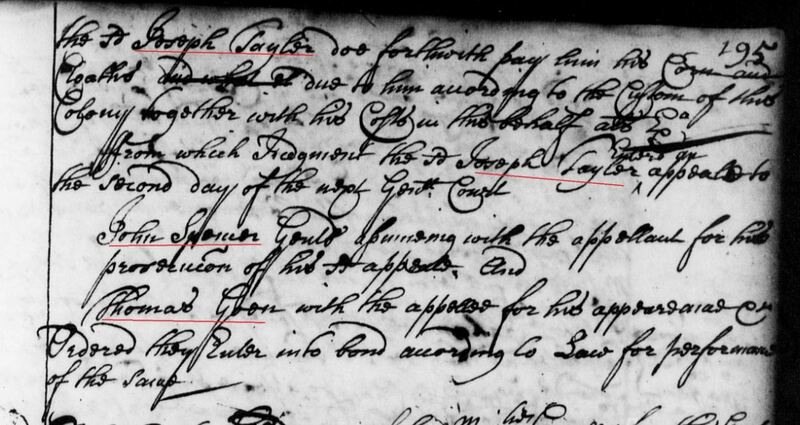 1612-15’s families – see: https://goyengoinggowengoyneandgone.com/1593-john-hallowes-carpenter/ ). John Hallowes b. abt 1615 was first married to a Restitute Tew – His 2nd marriage was to an Elizabeth Sturman (unk maiden name – she had previously been married to John Sturman). John Sturman (her first husband) was the brother of Anne Sturman Youell who had married Thomas Youell – the same Thomas Youell who was father of Anne Youell who had married Thomas Atwell). (see: https://goyengoinggowengoyneandgone.com/1613-to-1616-john-hollis-of-md-and-va/ ). It is uncertain “which” Anne Youell and John Hollowes/Hollis these were that were married, but its obvious there was a family relation here. Again, just as a reminder, the Y-DNA of the Gowen and Hollis families in the south are a match. This appears to add additional evidence that the John Hollis b. abt. 1700 family is related to the John Hallowes b. abt. 1612-15 family). 1703 Aug 25: Thomas Goen acknowledged Danll McCarty to bee his attorney in an accon (action) comenced by him agt Charnock Cox. Westmoreland County Court Orders 1698 to 1705. pg 200a. 1703 Nov Ct Thomas Gowing v Charnock Cox: In an accon of tresspass in assault and battery brought by Thomas Gowing agt Charnock Cox upon the mocon of the Deft a speciall imparlance is granted him untill next Court. Westmoreland Co, Va Court orders, 1662-1873 p 212. 1703 Dec 31: At a court held for the sd County the 31 day of December 1703. Bruce vs Barrow} John Bruce being summoned as an evidence agt Thomas Goen for Edward Barrow in the suite depending between Edwd Barrow pltf and Thomas Goen deft and haveing made oath hee had attended three dayes ordered that the sd Barrow pay the said John Bruce according to Law with costs at execution. Westmoreland Co Va Court orders 1690-98 p 213a. 1703 Dec 31: In the accon of case brought by Edward Barrow agt Thomas Goen for that the sd Barrow did not prosecute the same to effect upon the mocon of the Deft a nonsuite is grted him against the said Edward Barrow and ordered hee pay hte same with costs at execucon. Westmoreland County Court Orders 1698 to 1705. pg 216. 1704 March 1, 1704/05 – the Westmoreland County Court ordered Thomas Gowen to pay to Edward Barrow 1,200 pounds of tobacco which Thomas Gowen had lost to him in a horse race. 1710-1722 – Chart of George Mason III showing purchase of Thomas Gowing‘s 653acres, in Fairfax/Stafford Co, Va.
1714 March 22 – 5-44 – James Brechin of Westmoreland, receives 795 acres . . . adjacent to Tho’s Going. p 57. Va. Land Trans – Stafford Co.
1724 Jan 20 – A-115: George Mason Gent. of Stafford Co 250a in said Co. below falls of Petowmack adj. land Mason bought of Thomas Gowing, adjacent to Col. Tho’s Lee, in Stafford County, Va. p. 79. http://image.lva.virginia.gov/LONN/NN-3/290-1/101-200.html (p 115). 1746 Mar 17 – F-270: Mr. Daniel Jenings of Fairfax Co. 1053 A. in said Co. Surv. Elias Davis. Jenings purchased 795 A. granted Rev. Mr. James Brechin. 20 Dec. 1716, 195 A. granted Capt . Simon Pearson 18 Feb. 1729, and 12 A. granted said Jenings 25 Nov. 1740. Resurv. added 51 A. surplus. Adj. Thomas Goings now Mr. George Mason granted 20 Jan. 1724, Major John Colvill, Lubbers Br., James Robertson, Gabriel Adams. 17 Mar. 1746. p 15. Land Trans – Fairfax Co.
1743 A Feb 16, 1743 lease of Thomas Going receives 100 acres from Robert Bates in Fairfax County, Va. Here he performs the contract himself, indicating he is at least 21 years of age by this time. 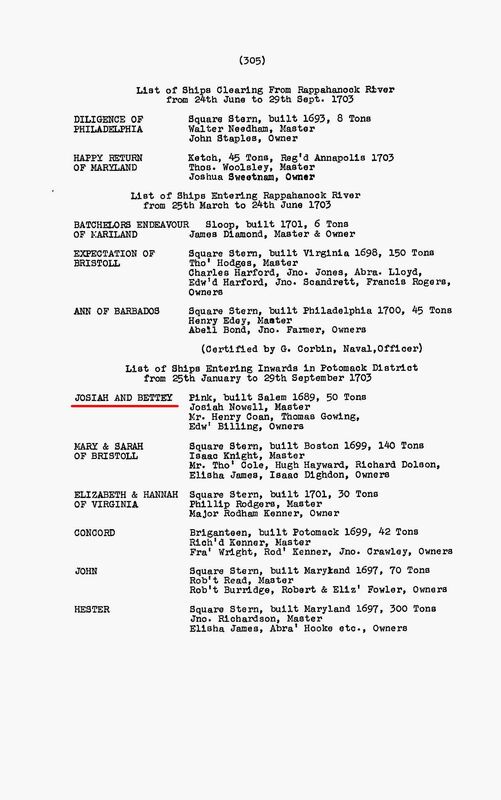 “… between Robert Bates of Fairfax County planter of the one part and Thomas Going of the same County planter of the other part … Robert Bates for and in consideration of the rents duties reservations and covenants hereinafter reserved … behalf of the said Thomas Going … grant set and confarm let to the said Thomas Going one messauage plantation tenement tract of lander whereon he now dwells containing 100 acres … being part of a greater tract of land granted …. the said Thomas Going … paying to the said Robert Bates … the sum of six hundred and thirty pounds of Tobacco yearly during such subtenants … the yearly rent … Signed: Robert Bates, Thomas Going. Wits: Margaret Terrott, William Carrol, WIlliam Henry Terrett. Proved up in Fairfax County Court on Feb 16, 1743 by Robert Bates. ” Deed bk A1, p 101. Fairfax County, Va. Note: On Feb 4, 1739, James Going was listed as the owner of property that was adjacent to John Colvill, Robert Bates, Gabriel Adams, James Robertson, the late Rev. 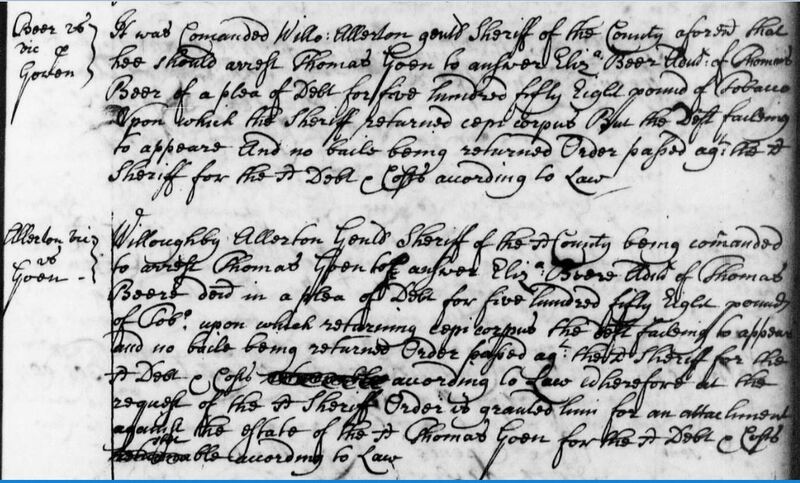 Mr. Brechin, and Simon Pearson – according to a deed granted to John Colvill on Feb 4, 1739 in Prince William County, Va.
1744 March 5 – Deed: sale of 56 acres to Thomas Ford, 5 Mar 1743/44, Fairfax, Virginia, USA. “Fairfax County was created in 1742, and John Gowen and his brother, Thomas Gowen found themselves in the new county. John Gowen and Mary Keife Gowen on March 5, 1744 deeded to Thomas Ford the 56 acres of land he had inherited from William Gowen, according to Fairfax County Deed Book A-1, page 551. This land was located on the east side of Pope’s Head Run and was part of the 102 acres of land which had been granted toWilliam Gowen November 12, 1725.” [the figure 102 above should be 112, and 56 is 1/2 the original grant to William Gowen November 12, 1725 – ceb 25 Aug 2014] Fairfax Co, Va.
1752 Feb 4 – Thomas Going – Plat for 750 acres on the north side of Congaree, South Carolina, Pursuant to a Precept to me directed by George Hunter Esq his Majesties Survoyor Genl. directed the 4th day of February 1752. I have measured and laid out unto Thomas Going a plantation or tract of Land containing seven hundred and fifty acres situate lying and being on the North side of the Congaree otherwise Seludy River on both sides of the Creek called Collins Mill Creek butting and bounding on all sides on vacant land and hath such shape and form and marks as the above plat represents. Given under my hand this 9 of March 1752. John Fairchild; Description shows on map below to be: Future Lexington Co, SC (county south of Fairfield Co). D.S. http://www.archivesindex.sc.gov/onlinearchives/Thumbnails.aspx?recordId=95289 Looking at map – the description shows: http://battleofcamden.org/1773sc.jpg Petition for Thomas Goings indicates he has a wife and 9 children, and prays for 550acres on or about the Congree River. Petition on Feb 4, 1752. (Thomas Going – with 9 children – he has been an adult most likely close to 12-20 years (was probably at least 18 before his first child is born – so he is likely 30-40 years of age in 1752 – placing this South Carolina Thomas Going’s likely date of birth about 1712-1722 – which fits the estimated age of Thomas Going b. 1717-22). 1752 May 30 -“Thomas Going” received a deed May 30, 1752 to 150 acres “on both sides of Taillors Creek, being the lower part of a grant [of 600 acres] to McKisick for “six pounds Virginia money,” from John McKisick, according to Granville County Deed Book B, page 53. Witnesses were Thomas Hunter, Francis Maly and Broadhead Trulove. 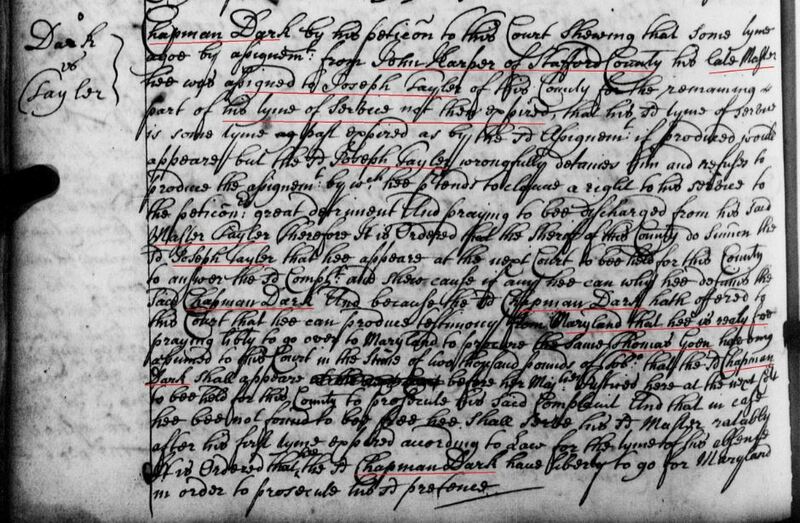 1759 January 14: will of Robert Tatum of Pr. Geo. Go. Wife to have all of land during her life. Recorded Oct. 9, 1759. p. 118. 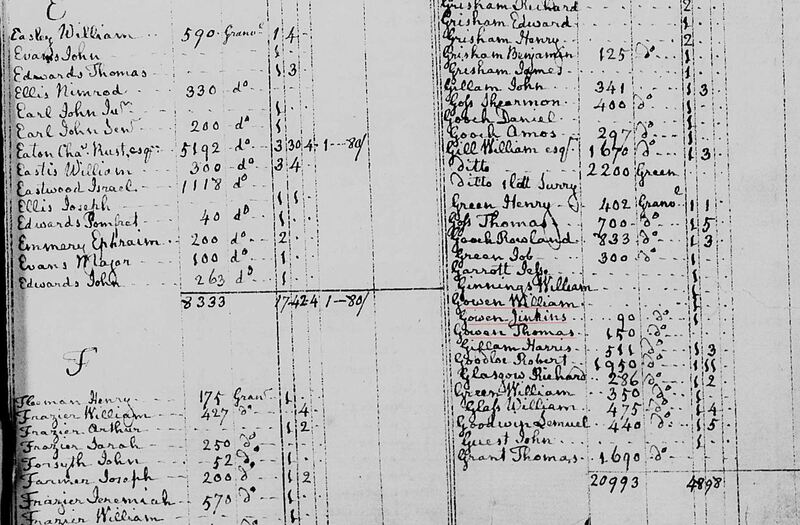 Prince George County, Virginia records, 1733 to 1792. pg 73. 1760 June 23 Ct with Thomas Gowen v Nathaniel Harrison case continued for next ct to plea, Order bk 8 p. 75, Brunswick Co, Va.
1760 June 23 Thomas Gowen v. Joseph King deft arrested for not appearing case cont for plea at next ct date, Order bk 8 p. 75, Brunswick Co, Va.
1765 Jan 26 – 81-(133) Richard Rains of Brunswick Co to Gray Briggs of Dinwiddie Co. 26 Jan 1765. £105. A mortgage for 307 acres which sd Rains purchased from Thomas Gowen, Richard Rains, Joseph Peebles, George Clayton, John Bailey, William Woodward, Lewelling Wmson, Joseph Wmson, Robert Gee Jr., Sd Briggs, Edward Adams, James Adams, Richard Atkins, Reuben Bennitt, Joseph Blayton, Bunell Claiborne, Francis Coleman, Samuel Coleman, Joshua Cook, Samuel Craft, Thomas Craft, William Duglas, Charles Edwards, H. Garrott, Robert Garrott, Henry Gee, Charles Golestone, Benjamin Harrison, Jr., John Hilton, Judith Jones, Tomas Jones, Solomon King, Richard Lanier, Richard Littlepage, William Lucas, Bernd. Major, Frizell McTier, James Proctor, Joseph Proctor, Robert Proctor, Moses Quarles, Richard Rains, Henry Rawlings, William Rawlings, Josiah Reams, John C. Robinson, Peter Simmons Jr, Thomas Steagall, John Tankersly, Roger Tillman, Littleberry White, David Wiggons, Joseph Williamson, John Wood, Gray Briggs. Proved 30 May 1765. N. Edwards DCC. Brunswick Co, Va.
1765 July Adam Sims v. Thomas Going, William Clack, Mark Jackson debt judgment for Pltf, Order bk 9, pg 335 Brunswick Co, Va.
1771 Thomas Gowin 2 unk Granville Co NC. 1773 Prince Edward Co titheables with Thomas Gowing. (just north of Lunenburg Co, Va). 1779 – “Thomas Going” was recorded as “one white poll” in the “List of Taxable Property in the District of Capt. Joseph Young’s Miltitia” taken by H. Nelson, J.P. “Thomas Going” reappeared in 1779 as “one white poll” in Capt. John Reno’s District. Washington Co, TN. 1782 Nov 20 – Thomas Gowens receives 300 acrs on Big Creek waters of Little River. Montgomery Co, NC (this is possibly Thomas Gowens b. 1750 who moved to Montgomery County, NC – and then moved on to the Washington County, TN area afterwards. If Thomas Goins b. 1729 (or b. 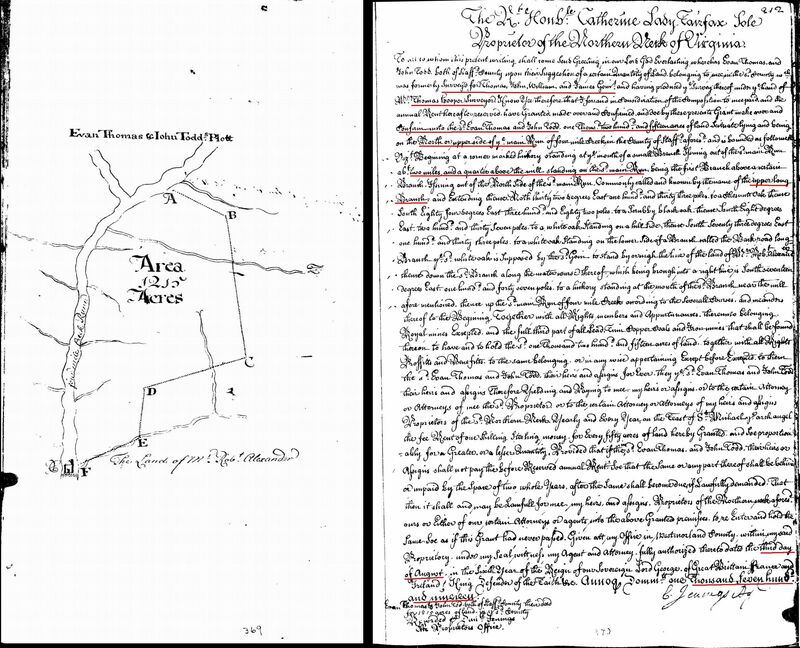 1720-22) is his father, then the father followed the son out to the Montgomery/Randolph County, NC some time between 1785 and 1790 prior to writing his will in 1797). 1786 Aug 18 – On August 18, 1786 an election was held “at the house of Mr. John Rennos where Charles Robeson formerly lived” to elect a “Senator and a Commoner.” “Thomas Goings” was recorded as voting in the election. 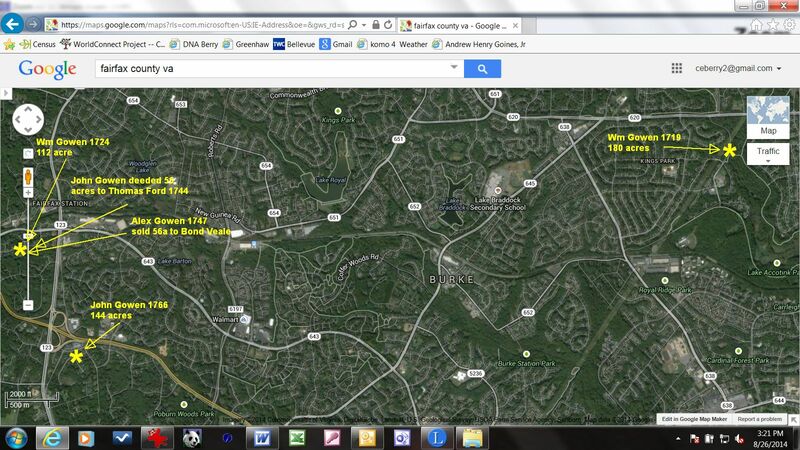 1786 Oct 26 – Thos Goin received 225 acres joining Tipton’s Line upon the waters of Cherokee Cr. 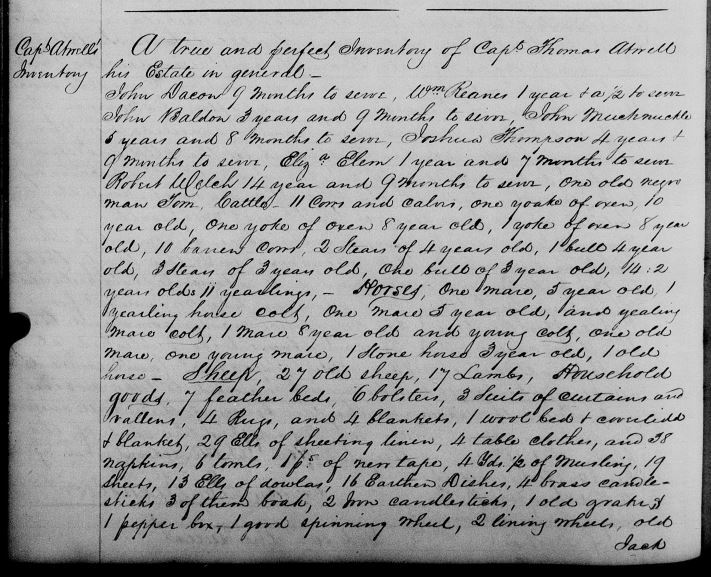 Washington Co., Tenn. 1786 Oct 26 – Thomas Goin fr State of North Carolina bk 4, p 48 https://www.familysearch.org/ark:/61903/3:1:3Q9M-CS4Y-XS7K-M?i=585&cat=276692 ; http://www.nclandgrants.com/grant/?mars=12.14.20.660&qid=82710&rn=17 Pvt Thomas Goins assigned his land warrant, No. 756, to Lardner Clark, an attorney who later practiced in Nashville. The grant was located on Cherokee Creek. 1788 Oct 14 Edward Gowen to nephew Thomas Gowen all the estate, right, and interest I have or may hereafter have to the Estate of Elizabeth Bass deceased, or any part thereof, and do hereby make over the same to the said Thomas Gowin his heirs and assigns from the claim of me the said Edward Gowen or any other person whatever claiming under me in witness whereof I have hereunto set my hand and seal this 14th day of October 1788. Signed: Edward Going. Wits: Henry Mcghe, Allin Hudson, John Simmons (his mark). John Simmons proved up in Nov Ct 1788. Granville Co, NC. 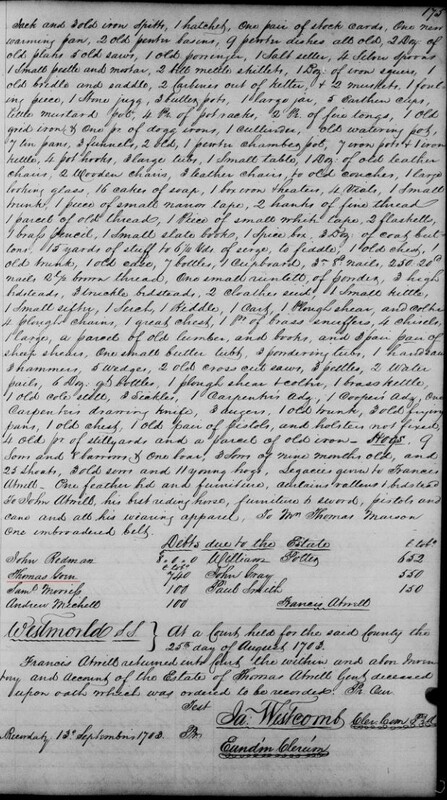 (NOTE: See the cited records below relating to Moses and Elizabeth Bass, and their relationship with the Going family of Granville County, NC). 1788 Aug – On motion of W. Avery, Esqr. attorney for Thomas Going for obtaining letter of Administration on the estate of Elizabeth Bass, dec. ordered that the same be laid over until next term, for proof of Kinship by blood & That a didimus postestem (a commission to take testimony) issued in favor of said Thomas Going to Anson & Richmond Counties & to the State of SC be given 15 days notice to Jermiah Bass of the time & place where such testimony be taken did po. for Levi Bass to SC giving Thomas Going a 15 day notice. John Simmons later appeared in Granville County Court to prove the deed of “Edward Gowing” to “Thomas Gowing,” according to “Court Minutes of Granville County, North Carolina, 1746-1820,” page 28 by Zoe Hargett Gwynn. Edward Gowen of Granville County, North Carolina, regarded as a kinsman of Thomas Goin, was also named an heir of Elizabeth Bass. On October 14, 1788 he conveyed his interest in her estate to “his nephew, Thomas Gowen,”according to Granville County Will Book 2, page 79. Granville Co, NC. 2 males over 16, 2 males under 16, 2 females – white. 0 slaves. 1794 Sept 15 – Thomas Going to Dudley McDearmanus 40 acres adjoining John Rudd, James Scott, and Col John Clarke. Signed: Thomas Going. Wits: William Singleton, Sarah Singleton, John Going. pg. 185-186. Prince Edward Co, Va. Transcribed by Tracy Hutchison. Not to be copied or reproduced in any format for profit. (I have attempted to transcribe as acurately as possible, however I am sure there is probably some errors). 1802 April – Thomas Goanes, 100 acres, 1802,” page 115, was included in a “List of Grants for lands in Buncombe County which have been perfected since and including April 1802 to the 1st of June, 1807,” according to “Transylvania Beginnings: A History” by Mary Jane McCrary. 1803 Nov 1 – On Saturday, November 1, 1803, Thomas Goin was instrumental in establishing the Big Barren Primitive Baptist Church. “Thomas Going” was recorded as No. 3 on the church roster of the men. No. 3 on the women’s roster was “Elizabeth Going,” possibly the wife of Thomas Goin. Richard Atkinson to THOMAS GOINS, for 52 lbs 10/, 100 A both sides Hendley Mill Cr adj Samuel Wheelor, Tillman. 7 Feb 1805. Wit. JOSEPH GOINS. THOMAS GOINS to Thomas Keeling, for 26 lbs 5/, 15 A adj Wheeler, Roger Tilman, Allison. Sept. 1806. Wit: Benjamin Wheeler, Jas D. Henley. Erwin Johnston & George Johnston (in debt to James D. Henley for $100 for bond executed to Edmond Henly decd, also $5.50 on acct) to William Trotter, in trust, for 5/, 30 A on both sides Bear Br of Hico adj Daniel Sargent formerly Simon Doyle, Wm. McDaniel; also 50 ½ A on s end of tract granted George Johnston 20 Dec. 1779 & descended to Erwin & George by George Johnston decd. 27 Feb 1809. Wit: R. Long, THOMAS GOINS. 1810 – “Jesse Going appeared in the 1810 census of Rockingham County along with Frederick Going, Zephaniah Going and Thomas Goines. THOMAS GOWEN (in debt to James Holloway for $46.93) to Wilie Brooks, for $1, in trust,a sorrel mare, hogs, furniture, working tools, crops of corn, fodder, cotton, tobacco. 19 Mar 1824. Wit: William Springfield. 1833 – Thomas Goin served on Claiborne County jury panels and in 1833 was listed as a “white male” taxpayer. 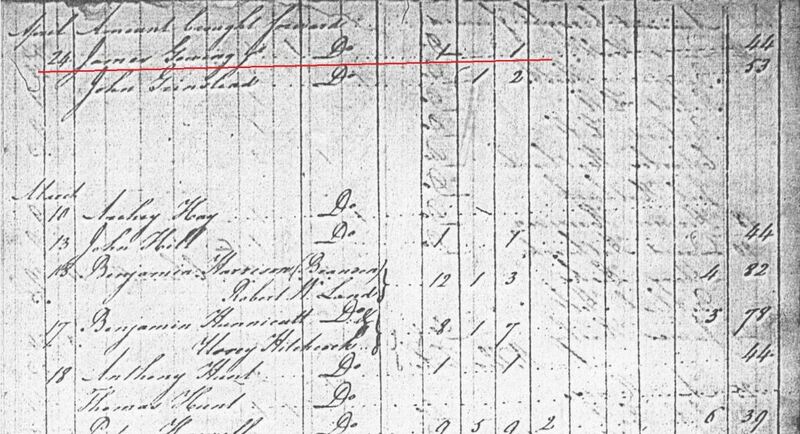 1783 – James Going was listed as the head of a household of seven people in the 1783 census of Greensville County, page 54, near the locations of “Drury Going” and “Thomas Going.” He was taxable in that year on “1 poll, 2 slaves, 2 horses and 8 cattle,” according to “The 1787 Census of Virginia,” page 778. 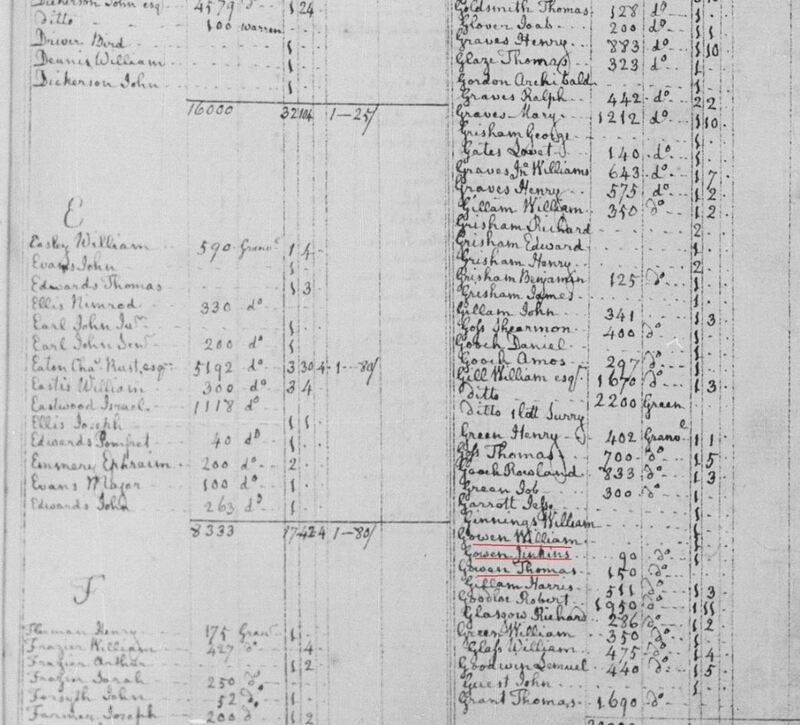 Greensville Co, Va.
1783 – Drury Going was enumerated as the head of a household of four in the 1783 census of Greensville County, page 55, adjacent to Thomas Going, according to “Heads of Families, Virginia, 1790.” Greensville Co, Va. List of William Maclin, Meherrin Parish, Greensville Co, Va.